My first introduction to these satisfying little snacks was in Southern India. Potatoes were an unintimidating meal for an exotic food-fobic girl when I was living there. I remember traveling overnight by train and being woken up frequently by the chaiwallas calls at each stop. You could purchase a handful of these little pastries, wrapped in grease spotted paper, through your window for the price of a few rupees. For the pastry, combine flour, salt and ghee with your hands until well combined and mixture resembles a coarse meal. Add warm water, a few tablespoons at a time until the mixture forms a dough. Kneed the dough for about 5 minutes till smooth and wrap in plastic and set aside at room temperature for at least 30 minutes. Boil potatoes till fork tender. Allow the potatoes to cool then peel and cut into small cubes. Dry toast cumin and coriander in a skillet over medium heat until the mixture darkens slightly and becomes fragrant. Grind half of the spice mixture into a fine powder and set aside. Add oil to the skillet and saute onion till golden brown. Add cumin and coriander, ginger, peas and diced seeded chilies and saute for a minute then reduce heat. Add potatoes, turmeric and garam masala and combine. Remove from heat and add cilantro and lemon juice, mix and season with salt and cayenne pepper to taste. Roll out portions of dough into thin 9 inch rounds and cut in half. Pinch together a cone from each half and fill with two to three tablespoons of filling. Seal the top of the cone and set aside to deep fry. 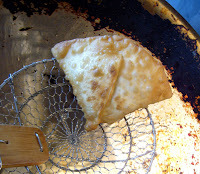 Fill a wok with a couple inches of oil and fry the samosas, a couple at a time until golden brown. is deep frying really messy? also, could you sub butter for ghee? I always deep fry in my wok, as it doesn't require much oil and the wide sides catch the splatters keeping my stove nice and tidy. You can substitute butter for ghee. I have in the past when I was out of ghee or didn't feel like making more. The pastry will still be light and tasty, although it won't have the nice toasty, nutty flavor that the ghee adds. Actually, instead of Butter or Ghee, Shortening can be used too. These are everyday street food in India and preparing them with Ghee or Butter makes it expensive. Most excellent. How do you make ghee? Ghee is really simple to make at home. Here is an easy to follow recipe: Link. You can use any amount of unsalted butter, so don't feel like you have to make a pound of ghee. I also don't bother using cheesecloth when making it. I just run my ghee through a very fine mesh strainer. I love these things. I grew up in the southern part of Africa were we ate tons of these.The pastry was made very different though, very thin, almost like a phillo pasty. Me and my DH love samosas (being Indian, we have no way out!!). I developed an aversion to the smell of frying when pregnant over 2 years ago and started baking these delicious morsels of potato-goodness in puff pastry pockets. 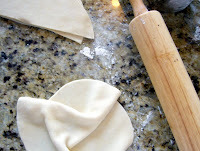 Just cut up one long roll of the pastry, divide into 3 and then fold over into triangle shapes after filling. Bake at 350 for 25 minutes and you get the same taste - minus the mess! Also, you can try to alternate the potato mix with some good old spinach and cheese samosas, sigh - now I gotto go home and cook!